First things first: I am not particularly enamored with hip-hop as an art form. This is not a value judgement, but it is a personal preference. When Lin-Manuel Miranda's musical Hamilton first hit the scene with its hip-hop infused score, I was skeptical. When people went crazy for the show and declared it a work of genius, I became really skeptical. Despite Kristy's initial trepidation and The Bear's early disdain for the cast recording, both were eventually hooked. During our 2017 trip to Copperhill, TN, Kristy participated in an on-line lottery for face-value tickets and successfully emerged from the digital abyss with three precious seats for a May 27, 2018 performance. I was still skeptical, but I was not throwing away my shot. As further evidence that The Bear is on track to be more worldly than her aviator / scientist father, she has been to New York City four times in her short life; only two times fewer than me. Contrary to popular belief, the fact that we live in New York does not mean that The City is a quick jaunt down the road for us. A typical journey begins with driving five hours to Poughkeepsie, home to the northern terminus of the Metro North commuter rail line. From there, two hours on a southbound train delivers us into the elegant and cavernous Grand Central Terminal on Manhattan's east side. This route has worked well for us and taking the train eliminates the hassles of driving and parking in NYC. In 2017, New York state legalized ride sharing services like Uber, creating a link between airports and train stations and enabling us to use our time machine to expedite the journey. Though we traveled to NYC in March 2018, we were blocked from flying by low clouds loaded with ice. However, Memorial Day weekend found us aboard the Warrior and en route for our date with Hamilton. We launched on an IFR flight plan for an easy hop to Poughkeepsie (or "poo KEEP sie!" as The Bear and I call it for no particularly good reason). Along the way, Boston Center changed the final fix of our route from the Kingston VOR to FILPS intersection. Minutes later, New York Approach changed it back to Kingston. In a setup that is not at all confusing, the tower at Poughkeepsie's Hudson Valley Regional Airport still uses the airport's former name, "Dutchess Tower". That morning, a trainee controller directed us to join the pattern on a right base for runway 24 with another Cherokee already on a left base, essentially placing us on a collision course. I turned the Warrior away from the final approach course (temporarily putting us on a collision course with a third Cherokee on a five mile final) to yield the right of way, then aggressively rolled back onto final approach to land number two. We watched the Cherokee ahead of us bob and weave in the wind on its way to the runway, prompting Kristy to clutch her seat in anticipation of a rough ride. We tracked straight and true to the runway center line, touched down softly, and taxied to the FlightLevel Aviation ramp. FlightLevel Aviation is a small FBO chain comprising four locations: Poughkeepsie, NY; Norwood, MA; Brunswick, ME; and Cape May, NJ. I am happy to report that we have had good experiences with the three that we have visited to date. At Poughkeepsie, there is a $15/night parking fee; the first night is waived with purchase of ten or more gallons of fuel. The Bear at POU...does this make her a "POU Bear"? "That's a small tower," remarked The Bear. Clearly! As these photographs demonstrate, The Bear is taller than the tower. If Peter Jackson can play games with forced perspective, so can I. The ramp at Poughkeepsie was busy! I bundled the Warrior in her pajamas for a two night stay at our 186th airport. As I paused to admire this twin turbine beast, I had to confess that it looked like a better way to travel than our humble Warrior. 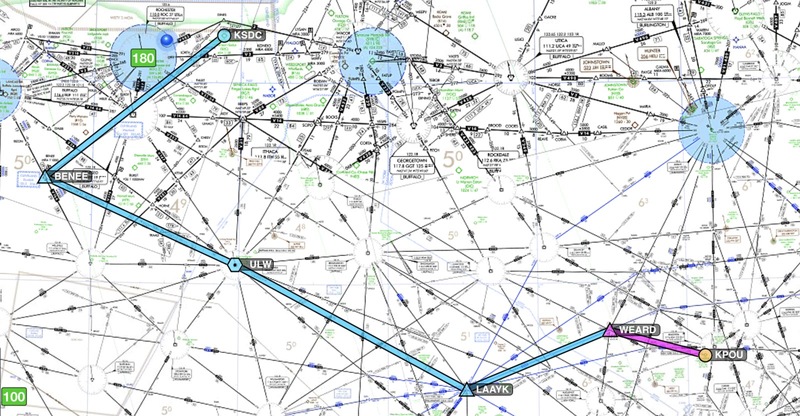 It probably gets better IFR routes, too (foreshadowing). Hudson Valley Regional is home to the Tail Winds West diner, a sister diner (are diners gendered like ships and airplanes?) to the popular original Tail Winds diner at nearby Sky Acres airport (44N). "Check out the pancake special," urged the pilot of the number three Cherokee that landed behind us. Three pancakes with strawberries, blueberry compote, and whipped cream. We wisely ordered a single pancake special with sides of sausage and home fries, then divided everything into thirds. It was absolutely wonderful. Not ordering my own plate was a fine example of exercising good PIC judgement outside of the cockpit that morning. All three of us departed very happily sated. After a quick Uber ride to the Poughkeepsie train station, we went in search of lemonade at some nearby restaurants. This was a more challenging quest than I expected, so I compensated by getting a beer instead. After all, the day's flying was done and I had earned it by eliminating all that boring drive time on the highway. Photo of The Bear preparing to board the Metro North train at Poughkeepsie earlier this year, 30 March 2018. There was something very gratifying about looking down over gridlocked cars on NYC streets as the train glided through Harlem along its elevated rail. The train may not be fast, but it is easy. We arrived in Manhattan during a heat wave and hiked from Grand Central to the DoubleTree Times Square South hotel in near 90°F temperatures. One particularly delicious perk of staying at DoubleTree hotels is the hot, yummy, check-in cookie. Unfortunately, being presented with these cookies on check-in serves as a reminder for The Bear that her peanut allergy prohibits her from eating certain baked goods (e.g., the aforementioned cookies). This usually makes for a tense moment. I intercepted the cookie proffered to her as gracefully as possible and squirreled it away in my backpack. In our room, The Bear collapsed on her bed after a walk that Kristy described as "a little death-marchy." A bit hyperbolic, I think, but I will grant that the heat worked against us. Being the excellent parents that we are, we waited for The Bear to use the restroom before secretly devouring our DoubleTree check-in cookies. They were still warm. When she emerged from the restroom, The Bear eyed us suspiciously. "How was your cookie, Mommy?" she asked Kristy pointedly. Kristy merely nodded without speaking, her mouth still full of delicious awesomeness. After a brief rest from the heat, we left the hotel to find dinner and reconnoiter the area. We found ourselves at Azuki, a nearby sushi restaurant on the corner of 36th and 8th Avenue where we dined on a previous trip. We paused for a moment to contemplate the works of art that we were about to devour. Dinner was excellent. In the process, The Bear declared her love for shrimp, though I wondered if what she really loved was the tempura coating. During our visit to NYC in March, we took The Bear to see Frozen, but could not commemorate the moment with a photo outside the theater because of the crowd. While roaming the theater district, we captured a belated photo of The Bear outside the St James. Given the heat, the notion of being "frozen" sounded positively blissful. Then she found it: the room where it happens. Masochistically, we made a brief visit to Times Square. The biggest problem with Times Square? All the damn tourists. I fully recognize the irony of this statement and I stand by it. Compensation for putting up with Time Square tourists came in the form of Ben & Jerry's and taking a very touristy souvenir photo. We awoke on May 27th to the drenching of Manhattan. Rain fell deafeningly on the sloped glass roof of the hotel's greenhouse-style restaurant. The heat had broken as well; high temperatures for the day floated around 60°F. In preparing to face the downpour outside, we took the opportunity to play everyone's favorite party game: "Dementor or Palpatine?" Opinions vary widely, but it is not a high stakes game, there is no single correct answer, and no prizes. Thank you for playing! The top of the Empire State Building was lost in the belly of a cloud. Even on foot, it can be hard to keep a pilot from thinking about the weather. We debated about a morning destination. With the weather precluding outdoor activities, our choice fell along a decidedly geeky path and we visited the well-regarded Museum of Mathematics (or MOMATH) for the first time. Did I mention that it was reasonably close to the hotel? Did someone say pie? I love pie! MOMATH was a decent way to spend a few hours out of the rain that morning. When we departed MOMATH, we discovered that the ceiling had risen several floors. Lunch was fish and chips at Irish pub Tir Na Nog on W 39th street near Times Square. With lunch out of the way, our nine month wait to see Hamilton was over. The Bear wanted to be photographed with all three Schuyler sisters, including the two important ones and the one that disappears mid-show without explanation. View from our seats before the show. Photo by Kristy. Our seats were in the fourth row, but off to the side and classified as obstructed view. This made them less expensive, but still brought us so close to the performers that we felt like part of the action. We had a very excited Little Bear as we waited for the show to start. How was it? I am still not a hip-hop convert. However, Hamilton's story is both compelling and extremely well-told. Lin-Manuel Miranda has a gift for presenting nuanced, well-formed characters that are interesting and relatable. And the music, infused with clever wordplay, veers stylistically from rap to traditional Broadway to Britpop in a way that complements the story and characters. It is difficult to judge Hamilton by individual musical numbers because the whole is greater than the sum of its parts. Melodic and lyrical motifs are woven throughout and evolve with the characters as the story progresses. Once he establishes them, Miranda calls on these ideas by the utterance of a single word or phrase with inspiring or heartbreaking effect. Considered holistically as a single work of art, Hamilton is brilliantly constructed to tell an engaging and moving tale and I was stunned by how strongly I responded to it. It truly is something special and, despite my initial skepticism (or maybe because of it), I am grateful to have had the experience. At The Bear's insistence, we dined on Indian cuisine that evening at a tiny, but well-rated restaurant called the Indian Project on 38th Street. Everything was quite tasty. We departed NYC the following morning on the 8:45 train to Poughkeepsie. Forecasts called for marginal VFR over Hudson Valley Regional, necessitating an IFR clearance to get home. I was concerned about receiving a crummy clearance from New York Approach, but hoped that Poughkeepsie was sufficiently out in the sticks to avoid too much entanglement with busy New York airspace. As the Hudson River Valley passed beyond the train's windows, I completed my flight planning and filed a reasonably direct airway route home from Poughkeepsie. Within moments, I received an expected route containing only a very minor change. After we arrived in Poughkeepsie, our Uber pickup happened within a minute of requesting it. Behind the blur of a turning prop, I contacted Dutchess County Ground for IFR clearance. ForeFlight had already warned me to expect a minor change in routing versus what I filed, a substitution of WEARD intersection in place of HELON. Either route was expected to cover 183 nautical miles in one hour and forty-three minutes. "Cherokee Four Eight One is cleared to Sierra Delta Charlie via the Dutchess Seven departure, radar vectors, WEARD, LAAYK, the 306 degree radial from Elmira, BENEE, Victor 164, direct, climb via SID, expect 8,000 one zero minutes after departure, departure frequency 132.75, squawk 7103." I scribbled furiously on my kneeboard to capture all the information, then contemplated my assigned route. Seriously? What happened to the expected route? As I plotted the course home, I began to wonder who I angered at New York Approach that morning. This new clearance added 104 nautical miles and nearly an hour to the return flight home. 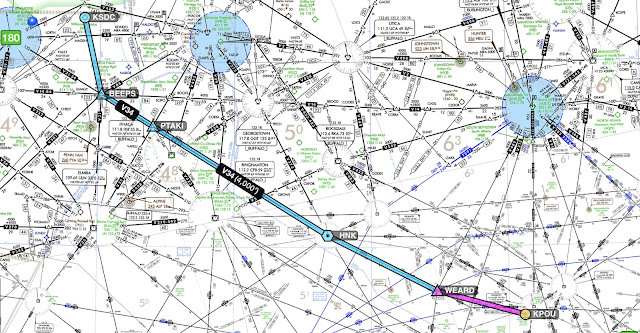 Moreover, the final portion of the clearance involving V164 made no sense; running southeast from Buffalo to Wellsville, the airway passed nowhere near Sodus. I resolved that I would request a better routing as soon as I escaped New York airspace, preferably long before reaching LAAYK. In counterpoint to the hot air that pooled so thickly around Manhattan's skyscrapers on our arrival, Memorial Day temperatures in the greater New York City area were in the high 50s beneath a thick overcast. 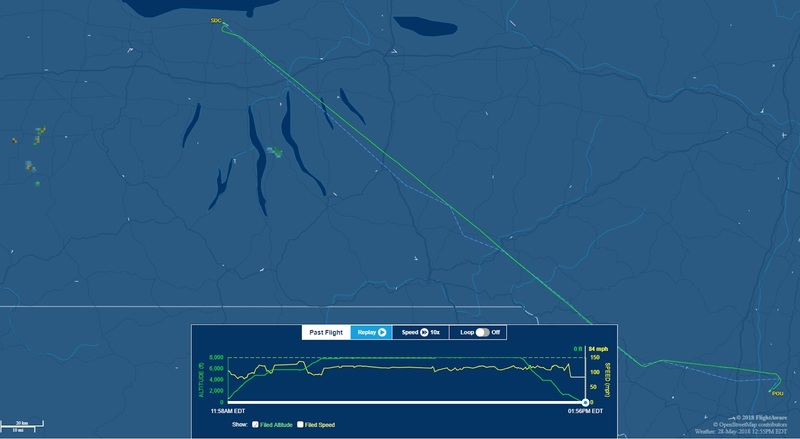 Our ascent from Poughkeepsie entered the clouds around 2,000 feet while still flying the Dutchess Seven departure procedure. New York Center cleared us to 5,000 feet, direct WEARD. When we emerged into brilliant sunshine after a morning spent acclimated to a leaden gray sky, the white of the clouds and the crisp azure sky were so brightly intense that they stung my eyes. Despite clearing the deck, the air about us shimmered in thick haze as sunlight reflected off of the almost palpable moisture that hung, barely suspended, in the air. It was a haze that seemed thick enough to drink. Past WEARD, we were handed off to Boston Center and cleared to 8,000. "November Four Eight One, climb and maintain 8,000." "Climb and maintain 8,000, Cherokee Four Eight One. Any chance we could get a more direct routing to our destination?" "November Four Eight One, I'll see what I can do." A moment later, the controller was back on frequency. "November Four Eight One, that's quite a route they gave you! You're cleared direct to your destination." We had left a dull gray world below to journey home in a fantastic realm of mist and vapor. Surely this was a more peaceful way to travel than five hours of hurtling down a confined highway while dodging rolling boxes of metal and glass. The Bear stretched out in the back seat and read for much of the flight home. Noticing that The Bear appeared to be sleeping peacefully in the back seat, I tried to capture an adorable moment. She was neither unconscious nor peaceful. Stinker. Entering the Finger Lakes region, the character of the clouds changed, transitioning from stratus to cumulus. Meanwhile, in the back seat of the Warrior, wackiness prevailed. After experiencing cool temperatures in Manhattan and Poughkeepsie, we were stunned by how hot it was in Sodus. Travel from NYC to Rochester is not usually something done in search of warmer weather. We returned to the Williamson-Sodus Airport victorious, having had a New York City getaway by plane, train, and automobile. Yes, we could probably tweak the route: perhaps use Westchester County Airport (HPN) and the Tarrytown train station to reduce our overall travel time. On the other hand, using Westchester County would bring with it higher cost, higher traffic, and probably an even less favorable IFR routing owing to its location beneath the New York Bravo. So, perhaps going through Poughkeepsie is not such a bad choice. Considering the number of trips that we have made to The City in recent years, I am certain that this one will not be our last. The Saturday morning breakfast crew was heading to Whitford's Airport in Weedsport, NY to sample more of John Whitford's cooking. My challenge was that Warrior 481 was in pieces and lacking both an alternator and a left magneto. Because he was helping with the annual inspection on my airplane, Mike was well aware of this and offered to let me ride back seat in the Champ. This is something I can do well: serve as ballast. And take pictures. Taxi for departure at Williamson Sodus. Alan launched ahead of us. At 7:30 am, the Williamson Sodus Airport ramp was incredibly quiet. On final approach to Whitford's. There is no surer sign that spring has finally arrived than two Champs parked on the grass at Whitford's for breakfast. Breakfast was good - eggs, sausage, and home fries. The room was full of area pilots and the cacophony of multiple conversations filled the space with life. Eventually, it was time to return to the real world. For me, there was mulch to spread and grass to cut. Alan preflights his Champ for the return flight. Our Champ was faster than Alan's and we caught up to him near Sodus Bay over a gradually greening landscape. Downwind at the Williams Sodus Airport, where the later hour brought with it more activity than we saw on departure. Final, runway 28, Williamson Sodus. On the way to the fuel farm, we passed my friend Scott readying Five Five Whiskey for flight. Our steed that morning was a 1947 Aeronca 7BCM. Aeronca was the king of inscrutable aircraft designations. Although this airplane formally belongs to Jack, Mike helped with its restoration and keeps the airplane very well exercised with Jack's encouragement. After fueling, Alan propped Mike's Champ and the airplanes taxied back to bed until the next trip out. As much as I love flying, sometimes it's nice to just ride along.